Has amazing skin regeneration properties. It helps to improve skin tone. Astringent so it acts as a balancer, reducing excess dryness or oiliness, returning the skin condition back to normal. Frankincense oil soothes and calms the mind, slowing down and deepening breathing and is excellent for use when meditating. Helps with shortness of breath, asthma, bronchitis, laryngitis, coughs and colds. It can be useful to ease heavy periods, is a general tonic to the uterus and has a calming effect during labor. It is also most helpful for rheumatism and has a positive impact on the urinary tract. Helps rejuvenate ageing skin, is a skin tonic and treats conditions like psoriasis and eczema. All tree resins are potently antibacterial and anti-inflammatory; pastes made from frankincense and myrrh can speed wound healing and prevent bacterial infections. Use of Frankincense Essential Oil on the scalp regularly strengthens the hair roots and make them strong from within. It also makes the hair thick and long. This essential oil is known for its positive and calming effect on the mind and body. It promotes mental relaxation by fighting off anxiety and stress. It also helps calm rage. This essential oil is useful for fighting off respiratory conditions like coughs, bronchitis, asthma and congestion of the respiratory and nasal tracts. It also keeps the lungs healthy. Frankincense Oil has properties that diminish spots and scars on the skin. Not only do they clear up eruptions and blemishes but also old stretch marks and scars. Frankincense Oil is very good for easing muscular pains. It is especially beneficial to patients suffering from rheumatism. It promotes blood circulations and supplies fresh nutrients to the affected regions. Frankincense Oil works as a great antiseptic for wounds and cuts. It disinfects the wound and prevents it from getting septic. 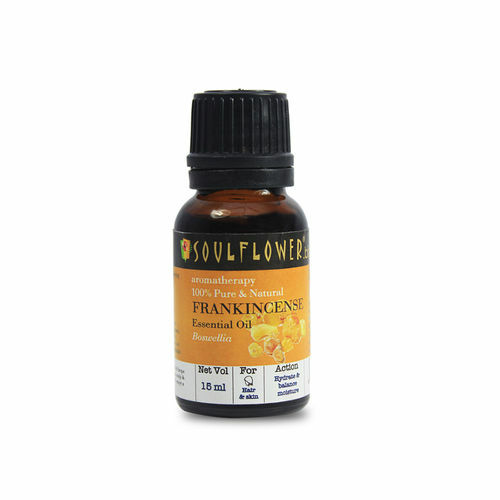 Frankincense is an effective astringent which keeps the gums, hair, skin and muscles toned and tight. Explore the entire range of Massage Oils available on Nykaa. Shop more Soulflower products here.You can browse through the complete world of Soulflower Massage Oils .